Experience an intimate performance at the city's incomparable, soul-infused event, The Park Unplugged. 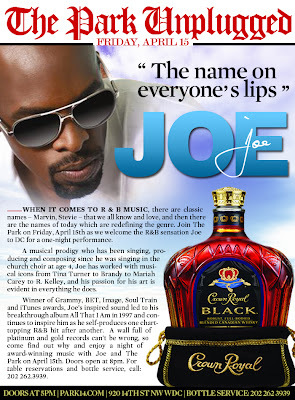 Singer and producer, Joe will be taking the stage this week. This Cuthbert, GA native has been receiving national and international recognition since 1997. Having a musical repertoire that rivals any other R&B singer, this performance will be one that all will enjoy. His signature style will consume #ParkFridays in a way only Joe can produce. Join us on April 15th for the city's leading happy hour at The Park at Fourteenth, D.C.'s sexiest international venue. Early arrival strongly suggested.